Okay, my brilliant son-in-law’s blockbuster novel is out! Okay, I have been initiated: I got my first rejection letter today from an agent. If I really want to be pessimistic, I could say it’s the first of many. However, I still have hope. Here’s the latest update! 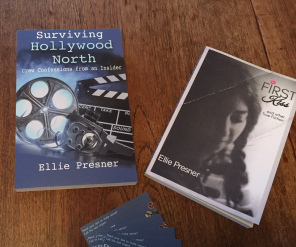 I’ve been up to my eyeballs in revisions on my little memoir, “Surviving Hollywood North – Crew Confessions of an Insider.” Oh, nothing too major, but still time-consuming.